February 14th is the day that we celebrate Saint Valentine's Day. Saint Valentine's Day is the day traditionally associated with lovers and romantic love, marriage proposals, giving gifts to loved ones, and of course sending St. Valentine's Day cards. A game of bingo is a fun game to celebrate the holiday. 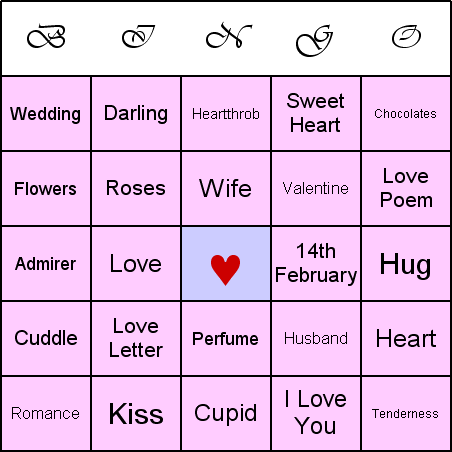 It is played almost exactly like standard bingo, but with one important rule change - instead of playing with the usual bingo cards containing numbers, it is adapted for the holiday by playing using bingo cards that instead are printed with words or phrases related to Valentine's Day. If you would like to play St. Valentine's Day themed bingo, the key thing that you will need is going to be getting bingo cards containing the words or phrases that relate to the holiday . It might be possible purchase some ready-to-made cards but they could be expensive and you could find that such bingo cards do not contain the precise items you want. Therefore, it might be wiser to print-out the bingo cards yourself, using your computer. This process can actually be surprisingly straightforward - You can download a bingo card maker program, and you can print out customized bingo materials with no more than a few minutes work. Finally, one other thing that ought to be mentioned is that St. Valentine's Day bingo can also be used language (including French, German, and Spanish) and ESL (English as a Second Language) classes. Not only because it is lots of fun, but also an excellent way to learn.